Kelly Car Buyer isn't just a junk car buyer. While we certainly do buy a lot of cars that are only worth their weight in scrap steel (i.e. junk cars), we also buy newer luxury sedans, older fleets of trucks, SUVs, mini-vans, and everything in between. We treat every vehicle as an opportunity. Some we fix up to be re-sold, some get broken down for valuable spare parts, and some do end up getting recycled. We'll ship cars all around Florida, or out of State, when they're more valuable in different markets. For example, four wheel drive vehicles can sometimes be worth twice as much in Chicago as they are in Orlando or St. Petersburg. It's the same for spare parts. 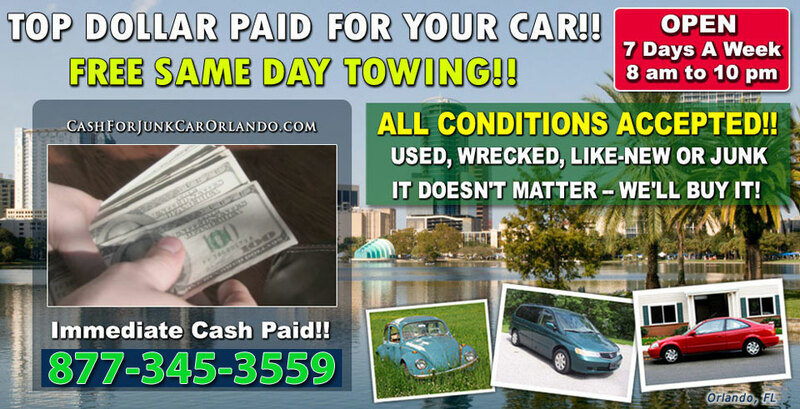 A used transmission for a 2000 Toyota could fetch a few hundred dollars in Orlando, but it could be worth significantly more in New York. We only buy cars in Florida, but our national relationships ensure that we can always get top dollar. We go the extra mile because it allows us to pay the most cash possible for the cars, trucks, and SUVs we are offered. We make a living buying cars, and we never forget that the best way to buy a lot of cars is to make the highest cash offers in Florida. Please contact us. In five minutes we'll have the information we need to make you an offer.